Looking for help on your latest essay or term paper? 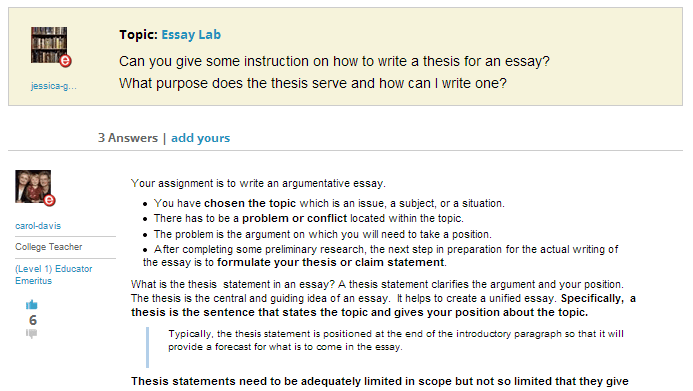 eNotes’ Essay Lab is designed to cater to your every writing need. Search our list of tips to tackle the most common essay hurdles, or ask a question of our educators to receive specific help with your prompt, outline, or latest draft. It’s all explained in depth below! For many of you, midterms are approaching, which means so are the essays and term papers. If you struggle with writing it can be hard to get the specific help you need, especially from the comfort of your own home. Tutors are expensive, and teachers are often too busy to offer the one-on-one help you need when writing or proofing essay drafts. But at eNotes we’ve got you covered. First, find the Essay Lab section at this link, or by searching eNotes’ Study Guides via the navigation bar at the top of every page. 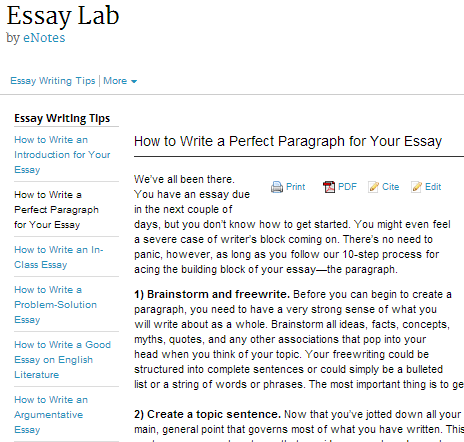 On the Essay Lab home page, you’ll see a list of our most popular essay writing topics. Each section is further broken down into step-by-step tips under the topics of “How to Write an Introduction,” “How to Write a Compare-Contrast Essay,” “How to Write an SAT Essay” and many more. You can use these tips to self-correct the way you go about writing each kind of essay. For assistance catered to your essay alone, head to the Essay Lab’s Homework Help area to talk with eNotes’ staff of expert educators. eNotes educators are teachers and professors themselves; who could be better to provide feedback on your first draft, or assistance with forming a thesis statement or essay outline? Just take a look at some of our recommended questions and answers here to see for yourself. You can browse hundreds of answered questions for free any time, or post your own question and decide how much to pay for an expert answer. 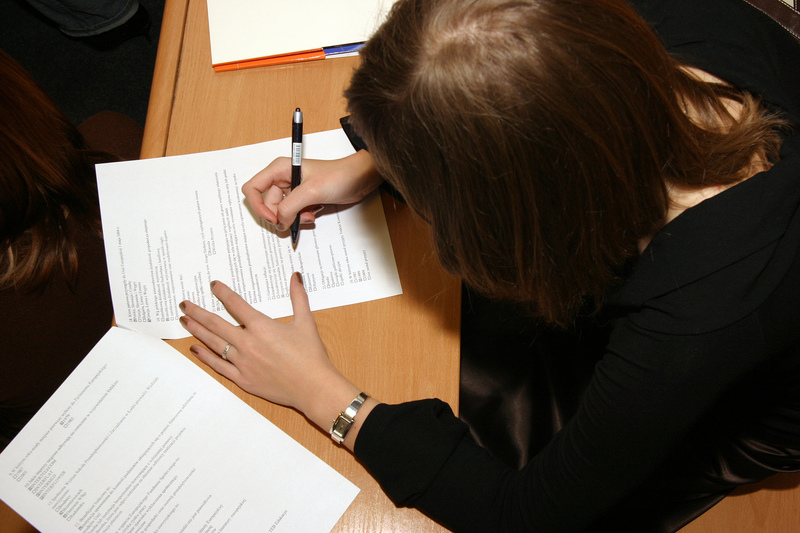 Many students post a first draft of their essay in a question to receive detailed proofreading and constructive criticism. Having that second pair of eyes—especially an expert set of eyes—on your paper can be a vital step to receiving the grade you want. We’re making magic in the Essay Lab. Ready to step inside? Check it out at this link today.